The voter turnout as of 2PM was 27.4%, says Yomiuri Shinbun, 7.79% lower than in the 2009 election. People on Twitter are reporting a huge turnout, despite the media report. I asked my parents how crowded the polling station was. They both said it was very crowded. Kyodo News is reporting that the number of voters who have cast their votes as of 11AM on December 16 is running lower than the previous Lower House election in 2009, when the Democratic Party of Japan won in landslide. Voting for the 46th election of the Lower House started at the stations all over the country at 7AM on December 16. The voter turnout as of 11AM is 14.03% (national average), 7.34 points lower than the last election's 21.37%. The so-called "third pole" parties have failed to make their cases to the voters, including Boy-wonder's party (Japan Restoration Party) and Ms. Yukiko Kada's Japan Future Party. They were all caught flat-footed when on November 14 Prime Minister Noda announced the dissolution of the Lower House and called the election in December 16, (at least) several months earlier than they had anticipated. Ms. Kada's party which many net citizens continue to have high hopes for its stance on nuclear power disappointed me for the lack of specificity on its "graduating from nuclear" platform and extremely weak policies on just about everything else (see my posts, here and here). I recently learned that Ms. Kada as the governor of Shiga Prefecture, which sits right next to Fukui Prefecture with "Nuclear Ginza Boulevard", ditched the fixed monitoring stations for radioactive materials and replaced them with one mobile monitoring vehicle, 6 months before the Fukushima accident. Her reason? "Why waste money?" The single monitoring car has been monitoring locations in Shiga Prefecture ever since the nuclear accident. Well she can keep the money. I hope she won't come to the national politics. About 8 more hours of voting time left (until 8PM) in Japan. Taro Yamamoto, the actor turned anti-nuclear activist who has been not just against nuclear power plants in general (like Japan Future Party and others) but against disaster debris burning, against contaminated food, against keeping children in Fukushima Prefecture and who is in favor of spending everything to clean up the mess even if it means national bankruptcy is running for office from the 8th District in Sugimani-ku, Tokyo. Kenji Sawada, known as "Julie" for generations of fans since 1960s, showed up in one of Yamamoto's campaign events on December 14, and urged the excited audience to vote for this "fine young man" who has stepped up to the plate to stop the nukes. I remember Yamamoto saying in one of the TV variety shows last year, "We should do everything, spend all the money necessary, to clean up this mess, help people and children in the affected area. Even if the country goes bankrupt as the result, as long as we have people, we can start again." He was roundly ridiculed by other guests at that time, as "unrealistic", as someone who didn't know anything about economics. It made sense to me. One of my favorite songs by Julie, from 1971, when he was a teenage girls' "idol". How time has passed. He still sings today, just like this, in the same key. Probably not your grandfather's LDP either. Liberal Democratic Party, which is neither "liberal" nor "democratic", has always been a party of convenience and compromise: pro-business as long as the party can control the business and receive donations, wearing "nationalism" on its sleeve when convenient, and pro-nuclear as long as citizens pay for it. But now, it has a decidedly different look this time around. Many second-generation, third-generation LDP politicians have clearly started to believe in their own rhetoric. I'm not too worried about the flags. After nearly 70 years of having been told, by your public elementary school teachers onward, that the Japanese flag is something that you should be ashamed of and shun, there is going to be a reaction to the other extreme. And for the majority of Japanese to whom the nuclear accident doesn't mean a thing as they eat food from the contaminated areas in Tohoku and Kanto, all they care is about economy, economy, economy, even though they remain extremely ignorant about how the economy and finance actually work. To them, Mr. Abe's harebrained idea of forcing the central bank to print money to create just the right amount of inflation sounds very sophisticated and wise. My tweets about what has happened in the US since the central bank started to massively intervene in the financial market fall on deaf ears, even among anti-nuclear followers. It's practically a religion in Japan that "deflation" is bad and "inflation" is good. They do not want to hear that under the monetary inflation caused by excess amount of mis-priced money in the system the intangible assets (like stocks) may rise but the wages may fall while the price of essential items like food and gas may rise. The Japanese often talk about learning from the past and learning from the others. They are good at talking. The voting will start at 7AM on December 16 in Japan. While the nation is engrossed with the upcoming Lower House election on December 16, the much-maligned Nuclear Regulatory Authority goes out and does one field survey after another at the nuclear power plant sites. It has just declared the fractured zones underneath the reactor at Tsuruga Nuclear Power Plant as "active faults", indicating it won't even conduct the safety inspection for the restart. Now, after spending two days in Higashidori Nuclear Power Plant in Aomori, the same group of researchers headed by Dr. Shimazaki, deputy chairman of NRA says it is likely that the faults that run through the plant compound are active faults that moved as recently as less than 100,000 years ago. Just like in the case of Tsuruga Nuke Plant, all 5 experts agreed. Go go, Nuclear Regulatory Authority's geologists and seismologists, before LDP shuts you down. On December 14, the field survey team of the Nuclear Regulatory Authority concluded the two-day investigation of the faults in the compound of Higashidori Nuke Plant operated by Tohoku Electric Power Company (Higashidori-mura, Aomori Prefecture). The team leader Dr. Kunihiko Shimazaki, NRA's deputy chairman, said that some of the faults "may have been active as recent as less than 100,000 years ago." All five members of the team pointed out to the possibility of active faults. The results will be discussed in the meeting in Tokyo on December 20. Tohoku Electric may be forced to review its seismic assessment of the nuclear reactors, and the restart of the plant may become difficult. For the two faults, "F-3" and "F-9" that run north-south on the west side of the reactors, the survey team went in the trench to closely examine the geological features around the faults. The researchers also studied the documents that Tohoku Electric had submitted, including the application for permission to install nuclear reactor. According to the seismic design standard set by the national government, an active fault inside the compound that is newer than 120,000 to 130,000 years ago has to be considered. Deputy Chairman Shimazaki raised the possibility that "F-3" and "F-9" faults moved more recently than 100,000 years ago, and said "If we consider that possibility, it explains the change in strata such as small faults nearby like "s-14" and "s-19". Deputy Chairman Shimazaki said of the December 20 meeting, "Basically, the point of discussion will be whether we can say these "are not active faults" or not." Vice President of Tohoku Electric Takeo Umeda said, "Scholars may have their own opinions, but we have ours and we will talk about them in the December 20 meeting." He emphasized again the company's view that there is no active fault that would necessitate the review of seismic design. Thanks to Dr. Shimazaki, I now fully understand the position of Tohoku Electric, or any nuclear power plant operator. Tohoku Electric does not see any active fault because that's not what they are looking for. They are looking for confirmation that there is no active fault, and as long as there is no such confirmation they can keep looking. To keep on looking is as good as no fault. After all, the plant operator is in a very delicate position, particularly those who actually do the investigation may be placed in a very delicate position, I suspect. Basically, [the operator] continues the investigation in order to prove that it is not an active fault, and as long as it cannot prove that it has to continue the investigation, so to speak. That is a totally different position than ours. Aomori Prefecture is conservative. I don't know about long time ago, but ever since the nuclear facilities have started to be built in the prefecture - Rokkasho Reprocessing Plant, Higashidori Nuke Plant, Ooma Nuke Plant - the prefecture heavily depends on government special subsidies and special taxes it can assess these nuclear operators. The plant operators also give generous "gifts" to the municipalities where the plants are located. It will vote LDP in the coming election, according to press reports, maybe in all 4 districts. (Update 12/14/2012) I asked Ryuichi Kino (who's now allowed back in TEPCO press conferences) about these maps. As far as he knows, these maps still ignores geographical information, and treat the land as flat. He says he will ask about it in the next press conference of the Nuclear Regulatory Authority/Agency. The dispersion simulation maps first announced by the Nuclear Regulatory Authority right were full of errors and had to be redone. NRA announced the corrected maps on December 13, but according to the article by Tokyo Shinbun, the real story is not the maps but how the maps were created. JNES had one person in charge of the job, and he gave it to a long-term subcontractor called CSA Japan in Tokyo, as usual. CSA Japan had one person doing the job of creating the simulation maps for the entire nuclear power plants in Japan, who used his pocket calculator to calculate the dispersion models. He apparently made numerous errors, resulting in the inaccurate simulation maps that NRA announced, to their embarrassment. No one at JNES or NRA checked the work. It's not that using a pocket calculator is bad. An Indian "computor" (a person who computes) calculated the height of Peak XV in Himalaya by hand calculation. It is all in the brain, after all. Mitsui Engineering & Shipbuilding Co., Ltd.
Why did NISA need to create simulation maps by contracting them out cheaply, which ended up on the lap of one unhappy employee at a subcontractor who used a pocket calculator? They have SPEEDI. My guess is that NISA figured it was cheaper to contract out anew than to run SPEEDI. "Cheap, cheap", sang a NISA bird. So sings just about every government agencies in Japan, large and small. Money before safety. That's what two "lost decades" have done to the country. By the way, the first set of maps not only got the wind directions wrong, but they didn't consider the topography at all, treating the land in Japan as flat. I don't know if that has been corrected in the new version. With a pocket calculator, it may have been a bit too complicated. PM Noda on Tsuruga Nuke Plant Reactor 2: "Decommissioning Likely, But Up to the Operator"
Much like the voluntary halt on shipment of produce that has tested with radioactive cesium exceeding the national standard. It's up to the producer to abide by the halt, and no government agency is there to enforce it. In a TBS TV program on December 13 evening, Prime Minister Yoshihiko Noda commented on Reactor 2 at Tsuruga Nuclear Power Plant operated by Japan Atomic Power (in Fukui Prefecture), saying "It (decommissioning) will be likely". Prime Minister said, "If the Nuclear Regulatory Authority says there is a safety problem, I will not allow the operation. It will be decommissioned, on the decision by the operator", prompting Japan Atomic Power to decide voluntarily. In the meanwhile, the same set of geologists and seismologists who unanimously agreed on the possibility of an active fault under the reactor building at Tsuruga Nuke Plant is now in Aomori, studying the trenches dug by Tohoku Electric Power Company at Higashidori Nuclear Power Plant to determine whether the four faults there are active. According to Mainichi, Dr. Shimazaki, who is heading the experts, says what Tohoku Electric calls "swelling" may be due to the active fault. I do suspect the days of the Nuclear Regulatory Authority may be numbered, particularly when I read LDP may win more than 280 seats in the coming election, and their findings will be nullified. Susan Rice, the embattled U.S. Ambassador for the U. N., withdrew her name from consideration Thursday to be Secretary of State. President Barack Obama confirmed the news in a statement Thursday afternoon, saying "While I deeply regret the unfair and misleading attacks on Susan Rice in recent weeks, her decision demonstrates the strength of her character, and an admirable commitment to rise above the politics of the moment to put our national interests first." Ms. Rice was the one who was sent to the media right after the attack on the US consulate in Benghazi, Libya in September 11 this year to tell the public it was a spontaneous attack stemming from the demonstration against the anti-Islam movie. Never mind that there was no demonstration that day at the consulate, as admitted by Ms. Rice herself, albeit more than 2 months later. Attacking her for her lies is "racist" and "sexist" in the US. It was reported in early November, right before the US presidential election (and therefore totally ignored), that the Benghazi consulate was an CIA outfit. Coincidentally, people between 55 and 69 ("boomer generation") are the ones who have disproportionately gained jobs since Obama took office. Jobs may be part-time, low-pay (most likely), but they are jobs nonetheless. The biggest loser is the group in the prime work years (25 to 54). It's so pathetic it is almost funny. Or at least the dialog between the reporters and TEPCO during the December 12, 2012 press conference was, probably unintentionally. It was funnier reading about it via the tweets by @ystricera, who has tweeted almost all press conferences by TEPCO and the government regulatory agencies since March 2011. Reporter: What time did the robot stop? Reporter: It's evening now, and you don't know the exact time? TEPCO: We will investigate all day tomorrow. Two human colleagues from Toshiba had to get exposed to 1.36 millisievert radiation to retrieve the robot, but just to the outside the torus room. For more of the mission of this clumsy Toshiba robot, see my previous post. (Investigation of Reactor 2 by the 4-legged robot, it was to enter from the northeast corner on the first floor and climb down the stairs, then..?) TEPCO "The robot first climbed down the stairs to go to the basement, then there are stairs to climb up to the torus room. The robot started to climb. Then the forelegs went up in the air and the robot fell backward." TEPCO "The robot was on a remote control. Two people went to retrieve the unresponsive robot. Since it fell down, we assume there were some unexpected problems. But the situation was that the forelegs were on the step already, and the robot was lifting the hind leg, then lost control and fell backwards." TEPCO "It was right after the robot started to climb." TEPCO "The robot was just starting to climb the stairs leading to the catwalk. So to be precise, it was right inside the torus room." (So human workers went to retrieve it, is that correct?) "Two people went to retrieve the robot. Because the location was right at the entrance, the radiation level was not that high. The max exposure was 1.36 millisievert." (Ikegami of Kyodo News: So the robot flipped over before the investigation.) TEPCO "It happened right at the beginning of the work, so no, there was no investigation done." (So you're not going to do the investigation tomorrow? When will the investigation be over?) "One or two vent pipes a day, so depending on the situation, there are 8 vent pipes, we hope to carry out the investigation at that pace." (What broke?) TEPCO "The robot didn't completely fall down, so we don't think it's damaged much. It was leaning against the wall behind it. Workers hand-carried it." (To outside the reactor building?) "To the landing just outside the torus room." (Where is the robot now?) "On the landing." (I suppose it is because the robot was so heavy that the workers had to leave it there for now.) TEPCO "Well, we can charge batteries there." (So the robot is temporarily placed on the landing, you say. But if you have it there temporarily without knowing the cause of the problem, there is no way to repair it. Are you going to take it outside [the reactor building] and inspect?) TEPCO "We're trying to figure out what to do." (What time did it stop?) TEPCO "In the morning." (It's evening now, and you don't know the exact time?) TEPCO: "We will investigate tomorrow all day." The US says it is not sure what it is that North Korea launched into space on December 11. China expresses regret. South Koreans protest. The object that North Korea sent into space on Wednesday appears to be “tumbling out of control” as it orbits the earth, U.S. officials told NBC News. The officials said that it is indeed some kind of space vehicle, but they still haven’t been able to determine exactly what the satellite is supposed to do. In a statement, the White House said the rocket launch was a highly provocative act that threatens regional security and violates U.N. resolutions. The United Nations Security Council on Wednesday condemned the launch, calling it a "clear violation" of U.N. resolutions. A spokesman for U.N. Secretary-General Ban Ki-moon said he "deplores" the launch. North Korea is banned from conducting missile and nuclear tests, under the terms of U.N. sanctions imposed after a series of nuclear weapons tests in 2006 and 2009. Missile warning systems detected the launch at 7:49 p.m. ET Tuesday. North American Aerospace Defense Command officials said in a statement that the initial indications were that the first stage fell into the Yellow Sea and the second stage fell into the Philippine Sea. North Korea said the launch was an attempt to place a satellite into a pole-to-pole orbit. Pyongyang's official KCNA news agency said that the rocket was fired from the Sohae Satellite Launch Center on the secretive country's west coast, and that the Kwangmyongsong weather satellite went into orbit as planned. But U.S. officials say the launch was a thinly veiled attempt to test a three-stage ballistic missile capable of carrying a nuclear warhead as far as the U.S. West Coast. Russia added its voice to the condemnation of the launch and also called on other nations to refrain from further escalating tensions. "The new rocket launch carried out by North Korea flaunts the opinion of the international community, including calls from the Russian side," it said. China, North Korea's only major diplomatic ally, said officials had urged Pyongyang not to go ahead with the launch, and expressed regret that it had taken place. OT: North Korean "Missile" Launch or "Rocket" Launch? On one hand, it is good that many Japanese now doubt some of the things (not all, by any means) that their government and the mass media tell them. On the other hand, the same people still truly believe that the foreign media is unbiased and reports only the truth, and that the foreign media will report what the Japanese counterpart will never report. The latest manifestation of this belief is over the launch of a satellite by North Korea on December 11. Twitter was abuzz almost right away, refuting the Japanese government's announcement that a "missile" was launched, or the government's characterization that it was "effectively a ballistic missile technology". The Japanese media duly reported as such. People indignantly tweeted, "See how deceptive they are. None of the foreign media is reporting it as "missile". They all say "rocket". See how our government twists the fact and tries to incite nationalistic fervor! We can't trust the Japanese media at all!" It's a beautiful narrative that fits what has transpired since March 2011. It seems people's focus is purely on semantics not substance, and the fact that the Japanese government called it a "missile" while every sane nation and media in the world called it a "rocket", therefore the Japanese government is a liar who cannot be trusted. The meme is still going strong today. Wall Street Journal: North Korea Claims Success in Rocket Launch [with the sub-headline saying "U.S. Confirms Object Reached Orbit; Pyongyang's Effort Is Seen as Provocation and Advancement of Missile Program"
In a written statement, North American Aerospace Defense Command officials "acknowledged today that U.S. missile warning systems detected and tracked the launch of a North Korean missile at 7:49 p.m. EST...Initial indications are that the missile deployed an object that appeared to achieve orbit. At no time was the missile or the resultant debris a threat to North America." Since the Japanese like the United Nation, what did they think? The UN Security Council has condemned North Korea for launching a missile in defiance of a UN resolution. The Council president, Moroccan ambassador Mohammed Loulichk, described the launch as "a clear violation of Security Council resolutions". The US says Pyongyang will face "consequences" for the launch, calling it a "highly provocative act that threatens regional security". The US and its allies view the launch as a disguised ballistic missile test. They hear what they want to hear, they see what they want to see. That's not just a Japanese phenomenon, but it's very pronounced in Japan. At least part of the reason may be their general lack of English language ability. When someone says "None of the foreign media said it was a missile, and the Japanese government lied", the comment is taken as the truth, coming from someone who must have checked all the foreign sources, and it takes on a life of its own and spread. (UPDATE) I just had a laugh for the night. In TEPCO's press conference on December 12, TEPCO has just said this robot has crashed. 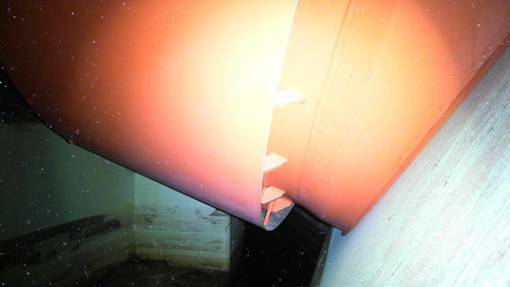 TEPCO was going to check one or two more vent pipes on December 12, but the robot lost its balance and collapsed on the staircase to the torus room and cannot move. TEPCO will investigate the cause of this malfunction tomorrow. In the demonstration in Yokohama in November, humans had to carry the robot off the stairs when it froze. I suppose Toshiba workers will have to retrieve the robot from the torus room, braving the high radiation. It was very stupid to send the clumsy robot like this on a task similar to the one that had caused it to freeze in the demonstration. TEPCO that cannot say no (or doesn't say no). In the video released by TEPCO on December 11, the Toshiba robot who froze with one leg up in the air during the demonstration in November in Yokohama takes time to put one leg forward and then another. It takes about 25 seconds for it to lift the left hind leg and put it on the next step. I feel sorry for TEPCO for having to accept a dud like this. The video title is "Investigation on the lower part of Unit 2 vent pipe at Fukushima Daiichi Nuclear Power Station (Mockup test)", indicating TEPCO is going to use this thing in Reactor 2. And it did. 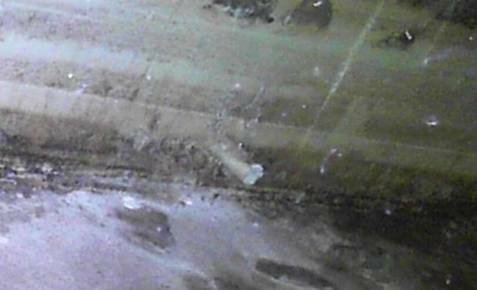 TEPCO just released the photos of the vent pipe that was examined by the robot on December 11. There is no discernible leak or damage to this particular pipe. No information on how long it took this robot to do the work. Page 3 says actual radiation dose was 1.75 millisievert, but no information whether that was for the robot or the robot operator(s). On March 15, 2011, a loud sound was heard from the Reactor 2 torus room, and Reactor 2 is supposed to have released radioactive material an order of magnitude larger than the other reactors. Just a short while ago, North Korea's missile, or "satellite", was launched toward southern direction. We will let you know as soon as we get more information. The missile was launched at about 9:49AM. It is estimated to fall on the Pacific Ocean about 300 kilometers east of the Philippines. No, the Japanese government did not shoot it down, though it apparently flew over Okinawa. Drama and suspense that LDP's Abe may have been hoping for are gone now. Still, his party seems to be duping enough voters and is expected to win the outright majority with the coalition partner Komei Party, who clearly enjoys being in the ruling coalition whether the main party is DPJ or LDP. There are neptunium and plutonium in Iitate-mura's soil, spiders are concentrating radioactive silver. Back in early April last year, IAEA said they had found 20 million becquerels/kg of iodine-131 from the soil. The highly political mayor of Iitate-mura says he will declare that the residents of this highly contaminated village return to the village in the fall of 2014. At the latest, by the spring of 2015. Mayor Sugano is planning to have the villagers back three and a half years after the worst nuclear accident in Japan. The national government will be delighted, as that will mean the end of paying the compensations to the villagers. As evacuation after the Fukushima I Nuclear Power Plant continues in Iitate-mura in Fukushima Prefecture, Mayor Norio Sugano mentioned the timing of issuing his declaration for the villagers to return to the village for the first time, saying it would be "around the fall of 2014". He was answering the general question during the Village Assembly on December 11. The national government plans to finish decontamination by March 2014. Mayor Sugano acknowledged that it may be delayed, but said "I want to issue the declaration [for the return] in the fall of 2014, or the spring of 2015 at the latest." Once he issues the declaration, the village office, currently evacuated to Fukushima City, will return to the village. Iitate-mura was designated as planned evacuation zone in April last year, and was reorganized into three zones this July depending on the air radiation levels. The national government has set the target date to lift the evacuation order in 16 districts in the village currently designated as "zone to prepare for the lifting of the evacuation order" and "zone with restriction in dwelling". There are 20 districts in the village. Iitate-mura is one of the municipalities in Fukushima Prefecture where the national government is in charge of the so-called "decontamination". 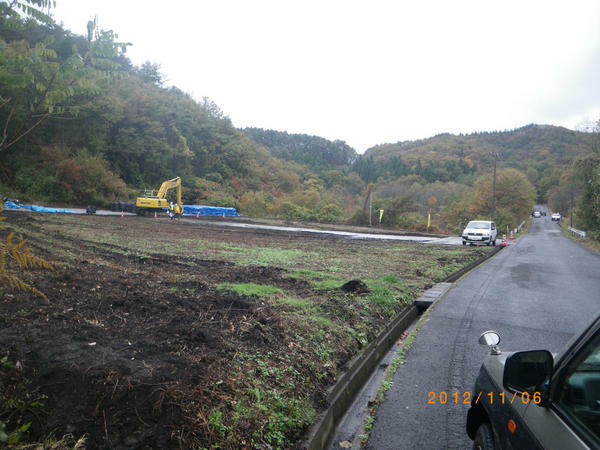 The decon project in Iitate-mura has been awarded to one of the largest general contractors in Japan (Taisei), but faced with the reality the scope of the project has narrowed significantly. All the government is doing and will do is to remove surface soil in the agricultural land (rice paddies, crop fields) and to clean up around residences. Forests and mountains won't even be touched. Even the decontamination of the farm land only makes sense in the minds of bureaucrats in the central government who have never worked a single day in the real world (like farm land). The government decontaminates (i.e. removes surface soil) the rice paddies, for example, BUT NOT the footpaths between the rice paddies. No decon work will be done on the footpaths, because the government's decon plan doesn't say anything about the footpaths, according to one of the very frustrated Iitate farmers who tweet. On December 7 when M7.3 earthquake hit Tohoku and Kanto, a man in his 50s apparently died of a heart attack in Iitate-mura when he tried to escape. He was working at a factory in Iitate-mura, which has been kept open and operational despite the nuclear accident. There are a few, large-scale machining factories in Iitate-mura which have continued to employ hundreds of Iitate villagers since the nuclear accident. One of the reason why it took until late April last year for the evacuation to take effect in Iitate-mura has been rumored to be Mayor Sugano's negotiating with the national government to make these factories exempt and allow them to continue to operate, employing the villagers as before. Many Iitate villagers on Twitter have been tweeting the high radiation levels in Iitate-mura. One of them, Mr. Ito, recently tweeted that the national government is creating a "temporary" storage area for the highly contaminated soil removed from farmland. Where is it? Right above the reservoir that feeds water to farmland. Outside the village, no one seem to care any more. All five experts on the Nuclear Regulatory Authority's panel agree it is highly likely that the fault that runs right beneath the Reactor 2 building at Tsuruga Nuclear Power Plant is an active fault. Chairman Shunichi Tanaka doesn't think it is even possible at this point to proceed with the safety evaluation to restart the plant. Experts have raised doubt that fractured zones inside the Japan Atomic Power Co. Tsuruga Nuclear Power Plant compound (Tsuruga City, Fukui Prefecture) may be active faults. The Nuclear Regulatory Authority held a meeting on December 10 to evaluate the result of the field survey. As to the fault that runs directly beneath the reactor building of Unit 2, all five experts agreed that "it is highly likely to be an active fault". Chairman Shunichi Tanaka, prefacing that his remark is personal, said "In the current condition, we have decided there is no way we can conduct the safety evaluation for the restart of the plant." NRA will hold a meeting soon to decide the appropriateness of the evaluation, but the prospect is that the restart will not be allowed. If the shutdown of the reactor continues for a long time, it is possible that people will demand decommissioning the reactor. This is the first time in the investigation of faults in nuclear power plants that a panel of experts determined a fault as active. In the evaluation meeting, the expert agreed that it is highly likely that an active fault, which is considered to be part of the "D-1 fracture zone" right underneath the reactor building of Unit 2, exists on the west side of the trench that Japan Atomic Power Co. dug for the investigation. Deputy Chairman Kunihiko Shimazaki explained the basis of their conclusion as: (1) The fault is considered to have been moving, as late as 100,000 and several 10,000 years ago, much later than 400,000 years ago which is a criterion for an active fault as defined by the government's Headquarters of Earthquake Research Promotion; (2) The fault is moving closely together with a [known] active fault near the nuclear power plant, "Urazoko Fault". I caught part of the live press conference that the Nuclear Regulatory Authority held on December 10 to announce their findings. Deputy Chairman Shimazaki and five experts who went to Tsuruga to investigate in early December were there, answering questions from the reporters. What struck me was two things: 1) Reporters from the mainstream media seemed knowledgeable enough on the subject to ask intelligent questions to the experts to get the facts out; and 2) The experts pretty much gave straight answers, without any seeming vested interest or ego. There were some very interesting exchanges between the reporters and the experts who were all geologists, particularly Dr. Shimazaki (seismologist by training). Isn't that the truth. I was rather shocked that Dr. Shimazaki very matter-of-factly stated it. If you think our conclusion this time [as compared to that on Ooi Nuke Plant] was made quickly, well I don't think it was quick. No. Personally, I think the same conclusion is reached if the valid data is there, and the decision can be made quickly if there is enough [valid] data. I am a bit annoyed if you think we made a casual decision with only the 2-day investigation. If the investigation is done properly and there is valid data, the number of days [to make decision] is in a way irrelevant, and the experts will agree on the conclusion, that's what I think. indicating that unlike Kansai Electric (in Ooi Plant investigation) the operator did have a very good set of data but didn't want to draw any conclusion that they didn't want. The Nuclear Regulatory Authority, before it was formed, was heavily criticized by many as being run by the "nuclear village residents" - people with strong ties to the nuclear industry in Japan, and as such it would be biased toward the industry and toward the restart of the nuclear power plants. It must be an unpleasant surprise for the industry, so far. The nuclear industry can hope for the day, very soon, when LDP's Abe is installed again as the Prime Minister of Japan, and fire these commissioners. Abe will have an excellent pretext of firing anyone who was not formally approved by the Diet (as PM Noda pushed through the appointment without consulting the Diet). The Nuclear Regulatory Authority's reportｓ are here. In his report at the site, Professor Takahiro Miyauchi of Chiba University Earth Science says Urazoko Fault and its related faults may be capable of generating earthquakes greater than M7.5, and urges the criteria for the evaluation to include not just fractured zones but this long stretch (35 kilometers minimum, as long as 65 kilometers) of faults right next to the plant. TEPCO doesn't have much to say about the rise in pressure in the Reactor 1 building at Fukushima II (Daini) Nuclear Power Plant after the M7.3 earthquake on December 7, 2012. 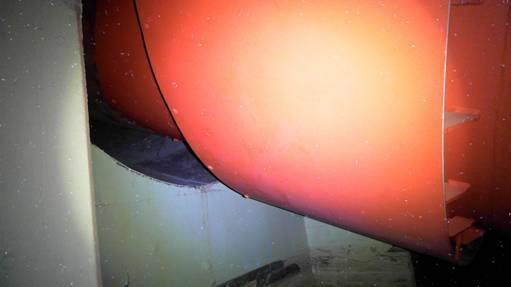 Yes they pumped the air out, thorough the exhaust duct, but no they don't know why the positive pressure happened. Just like anything else, they don't know the reason, but do immediate patchwork so that the undesirable conditions go away, for a short while at least. Hardly anyone pays attention to Fukushima I or II Nuke Plants or the workers there any more, anyway. People are having a good time electioneering, and many net citizens are feeling righteous about cheering for the candidates and the parties who profess anti-nuclear (beyond nuclear, graduating from nuclear, whatever) sentiment. At around 5:18 PM on December 7, a M7.3 earthquake occurred at the offshore of Sanriku. Upon plant checkup, no problem originating from the earthquake was found. Since the pressure in Unit 1 Reactor Building had turned positive (though the pressure is kept negative to the outdoor air), the standby gas treatment system* was started upon judgment of an operator. The pressure in the Reactor Building increased to 0.05kPa right after the system was started and later the pressure turned back to negative and became stable. In order to investigate the cause of the pressure turning to positive, the standby gas treatment system was suspended and the Reactor Building ventilation air conditioning system was started on December 8. The pressure in the Reactor Building is being maintained in negative after switching the system. The cause of the incident will continue to be investigated. * Standby gas treatment system: System that purifies the air in the Reactor Building utilizing high performance filter and discharge it to the outside through the exhaust stack. The system is comprised of systems (A) and (B). By the way, remember the fluctuation of the water being injected into the Reactor Pressure Vessels at Fukushima I (Daiichi) Nuke Plant, back in August? The fluctuation was supposed to be due to the shaving debris from pipe installation clogging the mesh screens placed at the valves, and after cleaning the debris in the tank and flushing the pipes all were supposed to be OK. But no, the water continues to fluctuate to this day, and all TEPCO does is to adjust the water amount. Curiosity may kill the cat, but I hope TEPCO's incuriosity will not kill us. Election in Japan: 94-Year-Old Candidate in Saitama 12th District Says, "A Man Gotta Do What a Man Gotta Do"
Mr. Ryokichi Kawashima was drafted and fought in the World War II for 7 years. He is plain angry at the chicken hawks in LDP and Japan Restoration Party and worried about the direction of the country. So, this 94-year-old grandpa decided to run for office from Saitama 12th District, using the money he has saved from his pension as the deposit (which will not be returned if he, or any candidate, does not get a certain number of votes in the election). He says, "A man gotta do what a man gotta do." Mr. Ryokichi Kawashima, who is a new, independent candidate in Saitama 12th District, is 94 years old. Grandpa, the oldest candidate in this election, speaks grimly about his resolution. "I used my pension savings for my funeral as election campaign fund." The youngest candidate by the way is Mr. Kazuya Aoki of DPJ in Gunma 4th District, who will turn 25 on December 13. He never wanted to become a politician, but as he listened to the politicians his fighting spirits were stirred. "Right-leaning (LDP President Shinzo) Abe and (Japan Restoration Party Leader Shintaro) Ishihara are moving to the right, they say "military" with ease. (Japan Restoration Party Deputy Leader Toru) Hashimoto is just absurd. We surrendered unconditionally [he is speaking of World War II]. What has happened to Japan? I got worried." He is a little bit hard of hearing, but his weapon is his rapid, machine-gun talk which doesn't stop once it starts. He was born in 1918, the year the World War I ended. He was drafted in 1939, to fight in the World War II. He fought in China for seven years, many of his fellow soldiers died. "I survived the war, I have had a good time. If I don't do anything now, I don't know how I can justify myself to the soldiers who died." On November 30, he gathered his family members to his house and declared that he would run for office. His family was initially against it, but he prevailed. "I thought I would ask my friends to help me, but they were all dead." Mr. Kawashima had worked in many industries. Now he lives by himself in his own home in Hanyu City in Saitama Prefecture. His back is straight, he walks with a spring in his steps. He cooks, does laundry, cleans, and drives, all by himself. According to the Election Department Management Section of Ministry of Internal Affairs and Communications, he is the oldest candidate at 95 years of age, among 1504 candidates for this election. It is a tough competition in Saitama 12th District, with the DPJ candidate, the LDP candidate, and former LDP candidate battling it out. "To be honest, I don't think I will win. But I want to make myself heard." His campaign pledge is the adherence to the Article 9 of the Constitution, opposition to nuclear power plants, and having the emperor as "head of the state" instead of "symbol". His campaign started late as he had decided to run right before the official announcement of the election. On December 7, he finally started to make pamphlets and posters. He plans to make campaign speeches on the street. "A man gotta do what a man gotta do." But you could almost hear the steps of the military boots in Japan these days, not just in bellicose campaign speeches by the likes of Shinzo Abe or Boy Wonder and his new sidekick Shintaro Ishihara. Just yesterday (December 9), the Osaka Prefectural Police arrested the associate professor at Hannan University for supposedly holding a demonstration without a permit to protest against the disaster debris burning in Osaka City. His alleged crime was to have walked about 250 meters inside the JR Osaka Station, handing out pamphlets in October. What scares me is not that he was arrested but the reaction of many prominent people I see on Twitter to this arrest, approving the police action as "legitimate", "their right to arrest as they see fit". All over the so-called developed world, left or right, the governments are exerting ever-increasing, arbitrary power over the citizens, and the citizens are hard pressed to find the reasons to justify what's happening around them. 94-year-old Kawashima must know that very well.